Lizard has decided to make a snow machine. The trouble is, once it starts to snow, he can’t make it stop... This entertaining story for beginner readers has simple rhyming text and stylish illustrations throughout. 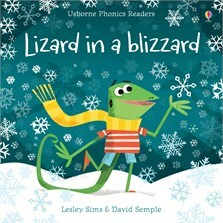 A delight to share with very young children, and with parents’ notes on phonics at the back of the book.